Our second visit to Key west was quite different from our first visit. Our oldest daughter and her husband were due to arrive on the Key West Express at just after noon. The Lower Keys Transit bus would deposit us about a block away from the landing terminal at just about noon. Bruce and I got to see a different part of town as we hopped off the bus and easily found our way to the water’s edge. We took advantage of the terminal seating and watched expectantly until the Express came in and docked. The crew sprung into action keeping the boat in pristine condition while the crowd of passengers began to pour out and make their way ashore. The kids had driven to Ft. Myers Beach to catch the ride to Key West instead of driving some eight hours to get here. They were thrilled with their choice as the boat ride was an event in itself. Key West is many things. There are parts that remind me of Hawaii, and of the BVIs, and even a sort of tropical New Orleans… Perhaps that’s why it’s such a popular destination for so many people. We heard people speaking many different languages as we walked the streets. There were shops lining the docks and streets and the ever popular bars… This place reportedly comes alive at night… but we would be long gone by then. The kids arrived fresh and ready to explore. I, however, was ready to find some lunch! Bruce consulted his KW Expert, Chuck to see where we could find a good meal. The food was good and really hit the spot. We left with renewed vigor, forgoing the tourist train that would take us around the town, for a long and winding walk to the other side of the island. The bored looks on the faces of the passing train and trolley passengers was enough to put me off even if I wasn’t so cheap! We each had things we wanted to see… First on my list was Duval St. and then Mallory Square. I must say, that in the light of day… Mallory Square left a lot to be desired. It was completely empty as we emerged onto the square and kept on going… It wasn’t important enough to us to warrant a stay into the evening hours. Maybe next time. We watched this stately cutter take tourists for a sail. 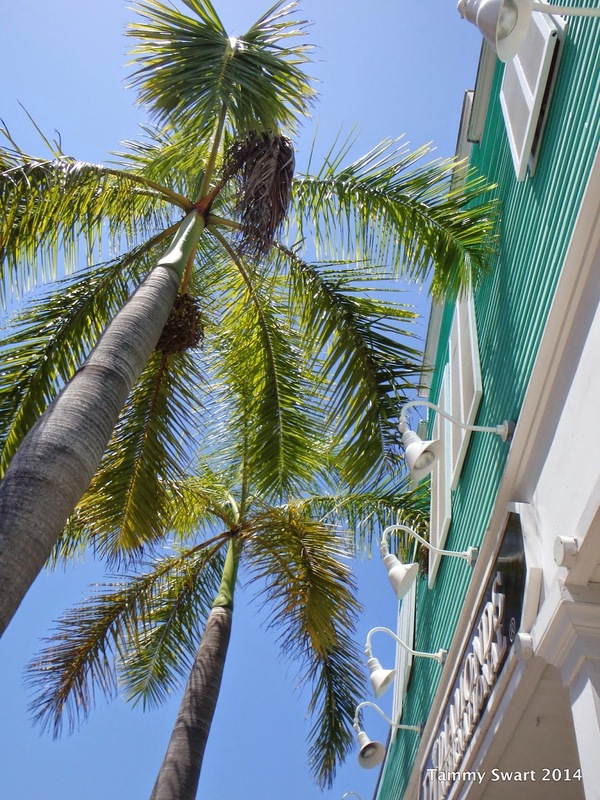 We enjoyed the sights and the old homes along Whitehead street as we went in search of our next stop, Ernest Hemingway’s Home. We walked many blocks and passed the Green Parrot Bar. The place was jumpin’ even in the middle of the day. There was standing room only and people spilled out into the streets as the live music pounded. Bruce wanted to go in and have a drink, but it was just too crowded. We found Hemmingway’s and the kids went inside while Bruce volunteered us to watch their baggage. We sat on the sidewalk in the shade like vagrants and watched the world go by. Key West would be a great place to come and spend a weekend away. There are so many cute little B&Bs and it would be fun to have a place to get away from the afternoon heat in preparation for a night out. There are SO many things to do here, it would be worth coming back when we had more time. Seriously... a line! Beats a free-for-all! The kids came out of Hemingway’s home with stories of the pool and the cats and the gardens. We continued on down Whitehead to our next point of interest… in fact, a Southernmost Point. I was amused to find that there was an orderly line of people waiting patiently for their photo op at the Point. Very soon it was our turn to get the obligatory photo…. tick that one off the Bucket List, now we still have time to find something cold to drink before we have to find a bus stop. We found not only a cold drink, but a beach as well for our viewing pleasure... at where else? But the Southernmost Beach Bar! And it was happy hour! We enjoyed beers and rum runners until it was time to head for home. And roosters... lots of roosters! We found the bus stop and watched the roosters squabble until our bus came to take us back to the boat. It had been a fun day but we left a lot un-done for future visits to Key West. 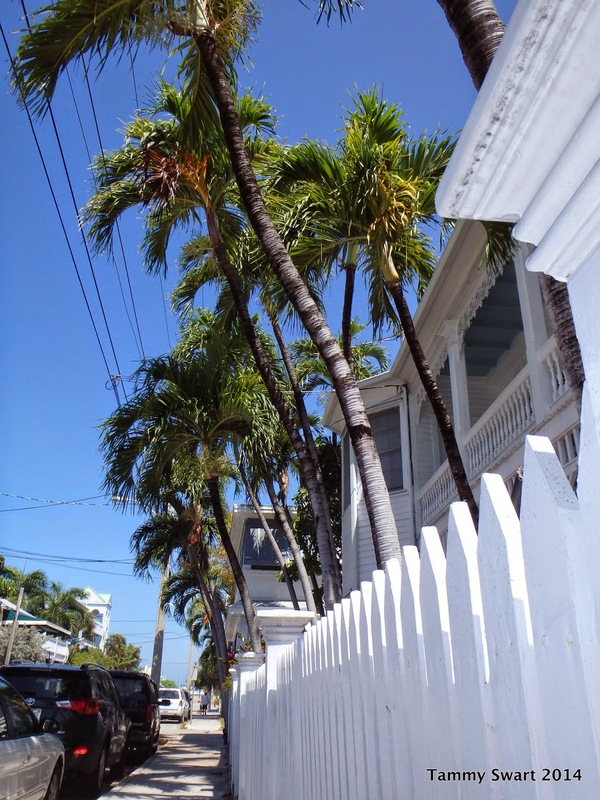 Please enjoy this slide show of the rest of our Key West Pics!